Probably the most frightening three words you could ever hear a doctor say are “you have cancer.” But cancer is no longer the automatic death sentence that it once was. Today, many people are surviving cancer, some as a result of medical discoveries in the field of cancer treatment and many because of new therapies in the field of alternative medicine. The term “alternative medicine” describes a treatment approach that uses only diet, vitamins, herbs, nutritional supplements and mind/body medicine, meaning yoga, meditation and other psychotherapeutic modalities. When alternative medicine is used along with conventional medicine, it is referred to as “complimentary medicine.” These approaches both utilize fresh air, clean water, exercise and a healthy lifestyle and are effective both in obtaining optimal wellness and in the treatment of many diseases. Scientists now know a lot about the role of diet and nutrition in cancer treatment. For example, medical research proves that diet is important in cancer recovery and prevention. Do you know the dietary changes that you should immediately make if you are diagnosed with cancer? It’s commonly known that chemotherapy and radiation treatments cause harmful side effects along with the good that they may do. But did you know that there are vitamins and supplements that can help prevent the destruction of your healthy cells while undergoing these cancer treatments? We know that cancer cells are hard to destroy. But lab studies indicate that there is a certain metabolic condition in which cancer cells cannot survive. What is it and how can you use this information to make your body an unwelcome host to cancer? These simple approaches to treating such a serious disease as cancer may seem too good to be true. You might ask yourself why there aren’t more open discussions about it. But you might be surprised to learn that many major cancer treatment centers in America and around the world now use complementary medicine for cancer patients. There are thousands of scientific research studies being conducted all over the world on natural substances that could help heal cancer. And there are about as many natural cancer treatments with empirical evidence of their effectiveness. A Google search will turn up hundreds of websites claiming to reveal the one and only magical cure. The truth is there is no magic bullet against cancer, and no single therapy is guaranteed to cure any cancer. But if you were diagnosed with cancer, wouldn’t you want to do everything you could to increase your survival odds? The field of naturopathic oncology is vast and complicated. Attempting to cure your cancer using a layman’s information is taking a huge risk with your life. Are you really equipped to sift through the information overload and identify what might really put you on the road to cancer recovery? Then there is the question of why do we get cancer in the first place. Do you know your cancer risks? Chances are there were you are doing every day that are known to be cancer causing. Wouldn’t you like to know how to potentially avoid ever getting cancer? 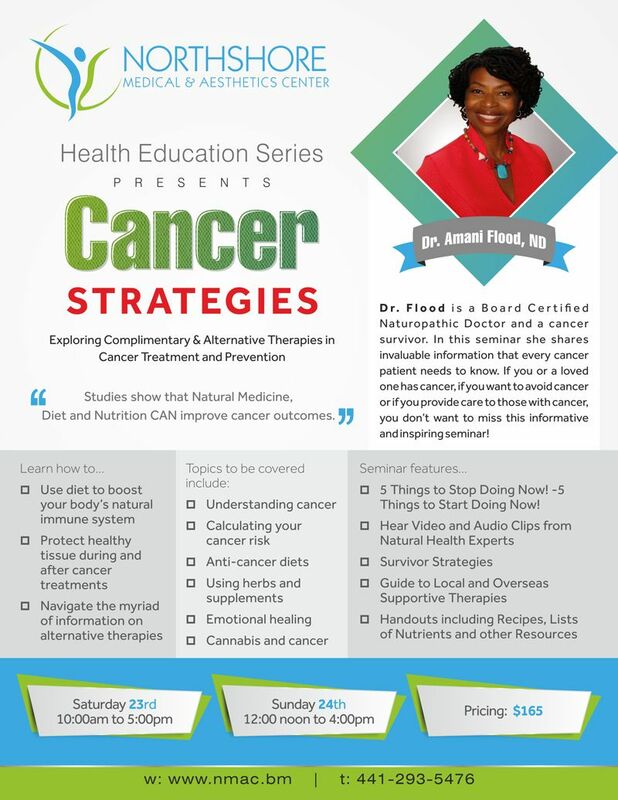 For the answers to all these questions and more, join me on January 23rd and 24th, 2016 at Northshore Medical & Aesthetics Center for a weekend symposium where you will have the opportunity to explore the subject of naturopathic therapy and cancer in depth. You will learn more than you ever could have imagined about cancer and about the role of natural medicine in the healing cancer. I am a cancer survivor. I was diagnosed nearly 20 years ago with a type of cancer that many don’t survive. Along my healing journey I learned a lot about cancer. I vowed to share this potentially life-saving information with others. Some say that the difference between a victor and a victim is that cancer victors believe that remission is possible. Information is the key to unlocking that belief. Come hear my story and the survival strategies of other cancer victors. Learn how to increase your odds at surviving and thriving over Cancer! There’s no such thing as “alternative medicine”. There’s medicine and medical procedures as proved by science. The rest is quackery and snake oil with a great story. In western society, alternative medicine is “coined” for natural or eastern medicinal practices. If you study the history of medicine, you will see that medicinal practices in Europe and the US are much younger than their counterparts. Medicine is driven by pharmaceutical giants that focus on treatment instead of prevention. What is she possibly going to teach you that you can’t find on google for FREE? We know why there is great reluctance to accept alternative medicine which is the basis of the medical system and it’s evolution ;because the medical establishment no matter how much good it’s doctors and other medical practitioners have done; that they and the pharmaceutical industry have involve in a vast industry worth billions of dollars and will not readily accept any competition even if that lowers cost and presents an alternative heath care system.